The 100 Corona coin is a 0.900 fine (21.6 karat) gold coin that was minted in Austria and Hungary between 1908 and 1914. Yet, the most common 100 Corona coins bear the mint date 1915 (Austrian 100 corona 1915), and were struck in 1916 as re-strikes to commemorate the reign of Franz Josef I, Emperor of Austria and King of Hungary from 1848 to 1916. The corona was introduced as a denomination with the Empire’s monetary reform in 1892, until Austria became a republic in 1918. 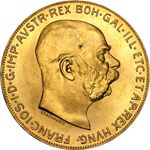 The obverse side of the coin displays the profile of Franz Joseph I and the lettering “FRANC. IOS. I.D.G. IMP. AVSTR. REX. BOH. GAL. ILL. ETC. ET AP. REX. HVNG.” (“FRANZ JOSEF I – BY GRACE OF GOD EMPEROR OF AUSTRIA – KING OF BOHEMIA, GALICIA, ILLYRIUM, ETC AND KING OF HUNGARY”). The reverse side features the Austrian Coat of Arms (a double eagle with crown), the denomination (“100 COR”), the mint year, as well as the inscription “C CORONA MDCCCCXV” (“C CORONA 1915”). The edge bears the inscription “Vnitis Viribvs” (“With United Forces”). The 100 Corona is a relatively sturdy and durable gold coin. The gold content of the coin weighs just under an ounce, which makes it a nonstandard size among today’s common 1 oz bullion coins like the American eagle gold coin, the Canadian maple leaf gold coin or the Vienna Philharmonic gold coin. However, the premium on the 100 Corona over their gold content is normally lower than for the regular 1 oz coins; thus, you get more gold for your money. Moreover, the 100 Corona is widely known and frequently traded, so you can easily liquidate it despite its non-standard size. The low premium makes it especially attractive for short-term investments.